Due to the tough economy, many of you are looking for ways to save money. There are many ways to save money and conserve water on your automatic sprinkler system. One sure way to help conserve water and save in watering costs is to have a rain and freeze sensor. 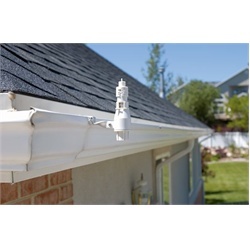 A rain sensor does a few things that will help you out. First, these sensors gather water from rainfall and send a message to your automatic water timer telling it to delay yard watering. Second, they detect freezing temperatures that could damage your irrigation pipes or sprinkler heads. Thus, rain and freeze sensors save money in several different ways. Freeze sensors can be purchased as wireless or hardwired devices. Another tool that will help you save money with your garden watering system is an automatic watering timer. You may already have one but if you don't, you may want to set your sprinkler system up on one. Doing this helps regulate water flow and automatic starts and stops lawn watering based on the programs and schedule(s) you choose. This is another cost-effective and easy way to conserve water and ultimately save money. Using water filters for your sprinkler system valves and water sprinkler heads is yet another way to cut maintenance costs. Valve and sprinkler filters trap debris to keep it from entering your water irrigation pipes and sprinklers. This reduces the cost and headache of having to make replacements that are unnecessary. Your lawn irrigation system can last many years if properly maintained. You can save money and conserve water by cleaning out your sprinkler pipes or hoses before and after every sprinkler season. Having replacement sprinkler parts on hand is also time- and money-saving. Use Orbit sprinkler parts to help your yard sprinkling system work most efficiently.